Add more magic to your trip. Saving £20 each on normal prices in resort! This is an early evening snowmobile expedition in search of the mystical Northern Lights. It is a short transfer (or walk) from your hotel to the meeting place where you receive a balaclava and helmet. The snowmobiles are then all ready and waiting for you. Full instructions and a safety brief are given before starting off. Children travel in a sleigh which is pulled by a separate snowmobile and adults share a snowmobile unless a single driver supplement has been paid. You drive the snowmobiles off together in convoy, looking out for any colour and movement in the sky. There is a break for hot berry juice and cookies by an open fire, ideal for viewing the skies above whilst your guide talks about the phenomenon of the Aurora Borealis and the myths behind it before returning to Saariselkä. Snowmobile driving for 1 hour plus 30 minute midway stop for hot berry juice, cookies and a story. Adults £101, Children (4-11 yrs) £79, Adult Sole Driver £137. Saving £10 each on normal prices in resort! This is a relaxing and magical experience for families or even a romantic sleigh ride just for two. You are picked up from your hotel and then taken to the Reindeer Farm. Here you are introduced to the animals and the local farmer explains why they are so unique whilst you enjoy a drink of hot berry juice. 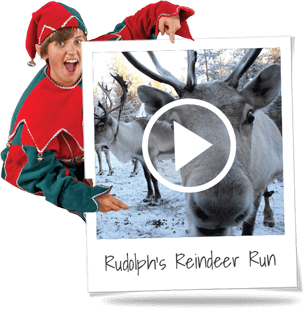 Then you snuggle under blankets as reindeer pull your sleigh through the unspoilt beauty of the Lapland forest, with only the gliding off the sleigh and the occasional sounds of the reindeer disturbing the peace and quiet. Adults £106, Children (2-11yrs) £82. If our included husky sled-ride whets your appetite, this additional trip gives you longer to feel the thrill of driving your own team of huskies. You are picked up from your hotel and then driven to the husky farm where full instruction is given on how to drive the sled and command the huskies. The sleds are driven by one adult who controls the brake whilst another adult and child or 2 children sit in the sled. Hot berry juice is provided during the visit and if there are 2 adults who want to drive then there is a chance to swap drivers. Adults £114, Children (2-11 yrs) £88. Saving you £20 each on prices in resort! This is a chance to drive out into the snowy wilderness surrounding the village of Saariselkä. You are met at your hotel and then taken to the Safari centre, where you are provided with a helmet and balaclava. The snowmobiles are just outside and, before you get the chance to start up, there is a full safety brief along with instructions on how to drive. 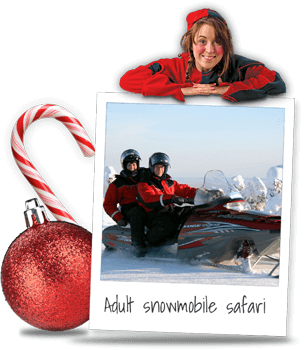 Children travel in a sleigh which is pulled by a separate snowmobile and adults can drive their own snowmobile (if booked with a single driver supplement). The convoy then starts, driving along recognised snowmobile tracks out in to the beautiful, snowy and natural environment of Lapland. Adults £79, Children (3-11 yrs) £66, Adult sole driver £114. 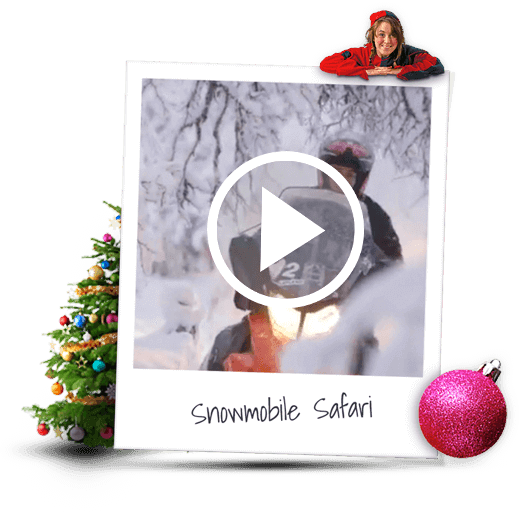 This is a more adventurous snowmobile trip for adults only with a chance to enjoy some adrenaline fuelled fun, speeding through the forests and snow-covered fields on what many people call the Arctic’s answer to quad biking. There is a full briefing on procedures and safety before starting. There are usually 2 adults per snowmobile although if a single driver is booked then you can take control and drive alone. At the mid-way point, there is a stop for cookies and hot berry juice, where the Safari guide can make a fire, but most groups wish to continue and choose to have a shorter stop and more time on the snowmobiles. Adults £101, Adult sole driver £137. 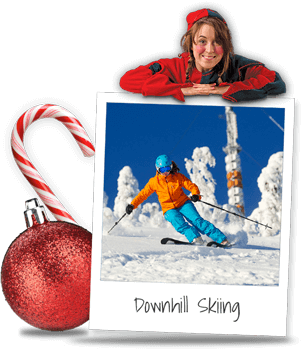 Saariselkä’s ski-slopes are ideal for beginners, or for intermediates wanting a quick ‘blast’! Price: Adults £62, Children (7-16 yrs) £52, Under 7 yrs £29. Private lesson package (with 90 minutes lesson, lift pass and equipment hire included): 1 person £111, 2 people £152, 3 people £194. Prices are per instructor depending on the number of people. 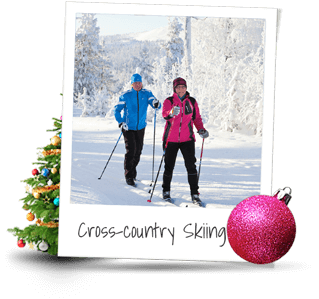 This is a lovely way to explore the tranquillity of Lapland’s pristine winter wonderland and perfect for families who love to be active and outdoors. Meet your activity leader at your hotel and then you are taken and fitted with the snowshoes which go over your boots. The snowshoes have a wide surface and small spikes to make walking on the snow easy and eve on soft snow away from the paths. The excursion is guided and full instructions are given so you can explore the local area. Adults £38, Children (6-11yrs) £25. Experience the beauty of Saariselkä’s surrounding landscape, skiing along well prepared tracks through the pure snowy whiteness of Lapland. Meet your guide at the hotel and then you are fitted with skis and poles before the explanation on how to cross-country ski. Learn the techniques on how to go up slopes as well as down them and how to glide along effortlessly with your guide. Adults £38, Children (6-11 yrs) £25. All prices and durations shown include transport to and from your accommodation (except downhill skiing). All dates and times of your pre-booked activities will be confirmed in resort by a Santa’s Lapland Representative. 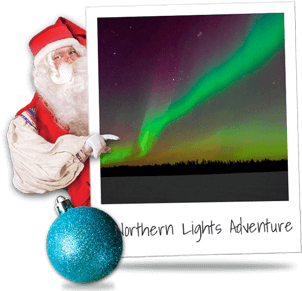 On my Santa’s Magic 3 day break, the pre-booked Northern Lights Safari will take place on your first evening. All other activities will take place on your departure morning. On my Santa’s Magic 4 day break, all activities where possible will be on your Adventure Day. If it is not possible to fit all your activities in on this day you will do one activity on your departure morning. On my Santa’s Aurora 3 day break, you will participate in your optional adventure on your departure morning. For my Santa’s Aurora 4 day break, activities will take place on your Adventure Day. 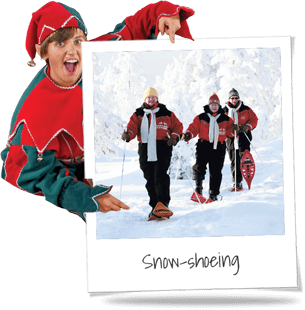 Please note that Santa’s Lapland acts as the selling agent for the supplier of excursions and activities. Please see Booking Conditions for further important information.